Inspired by the Crystal Palace building constructed in London, this structure was constructed in 1853 by an organization called the Exhibition of the Industry of All Nations. This organization held a world’s fair in New York City patterned after the highly successful 1851 Great Exhibition in London. The New York fair aimed to showcase the new industrial achievements of the world and also to demonstrate the nationalistic pride of young American nation. The Crystal Palace itself outlived this exhibition and was host to a series of fairs before it was destroyed by fire on October 5, 1858. Ironically that fire occurred when the American Institute fair, the one that this lithograph commemorates, was taking place. Within fifteen minutes of the fire starting the dome fell and the entire building was destroyed in less than thirty minutes. While no lives were lost, the loss of property value amounted to more than $350,000. 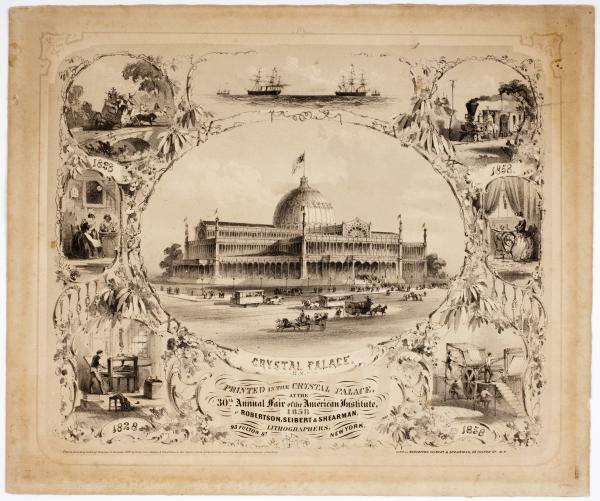 The center of this image shows the Crystal Palace in New York City complete with horse-drawn carriages and omnibuses. On the left side are three images of life in 1828 including a mail stage stuck in the mud, two women sewing by hand at night, and a hand operated printing press. On the right side are three complimentary images of life in 1858 showing how technological advances have improved the situations depicted on the left side. These include a steam train speeding along a track lined with telegraph poles, one woman operating a sewing machine in a brightly lit room and a steam-powered rotary press. All of the images on the right denote speed and light as well. Dimensions: 28 x 34 cm.